Little House Home Arts: Common Thread Give-Away Artist for February is a "Strong Woman"
Common Thread Give-Away Artist for February is a "Strong Woman"
This months Common Thread Give-Away Artist is Maria Wulf. 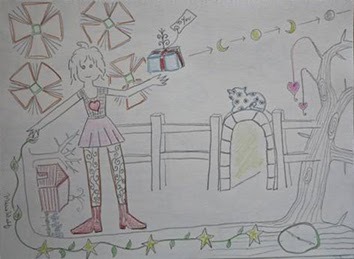 I have written many blogs about Maria: how I met her; and about her streaming and whimsical artwork that I love. I have also written about her life on Bedlam Farm with her husband, Jon Katz, and their Open House Events and Functional Art Sales. Interestingly enough what I haven't written about Maria, is what I admire most about her. Maria is a "strong woman" which I not only greatly admire, but love how she translates that into her artwork. I can't write about Maria's "strong woman" image without first saying that I was brought up by a mother who was raised on a farm in Nebraska with her six sisters and one brother during The Dust Bowl days. Being short of boys in the family and with many mouths to feed and not a lot of money, she and her sisters were raised to do "men's work". They milked cows, fed the pigs and worked in the fields along with their father and older brother and an occasional seasonal hired hand. Farm stories abounded when her sisters came to visit, and my siblings, cousins and I would gather to listen to them reminisce. We were all envious of their upbringing. They were fun stories and were all about the making of these "strong women". My grandmother was a "strong woman" too and stories were told of her taking time from her chores to give birth and then go out and hang up the wash. She was a well-educated woman for her day and kept wonderful journals during the time she raised her kids. More stories came as my mother and her sisters aged and they would read their mother's journals aloud to all who would listen and they enjoyed filling in the unwritten details. My grown cousins and I laughed as my aunt read the entry in one of my grandmother's journals about her brother, Doane, a county judge, "recovering well from being assaulted". My aunt added that he was clobbered over the head with a hammer by someone that didn't like his verdict! The entry read just as my grandmother would have reported it to her family, so calmly and matter-of-fact, like it was an everyday occurrence. I believe this was the same brother that went on to be a judge at the Nuremberg Trials. But back to Maria, except for her age, she would have fit in nicely with these country women who could run a farm and farmhouse all at the same time! From gathering eggs to making clothes and quilts, there was nothing that they couldn't do, and so it is with Maria. Maria's husband Jon has posted many a photo on his blog of Maria pitching bales of hay into the hay mow in their barn and caring for their sheep, donkeys, chickens, cats and dogs. She has embraced many a difficult situation as when Minnie, the barn cat was attacked by a wild animal and that tore her leg severely enough to have to have it amputated. Maria was there to support this cat to becoming independent again. In another picture, Maria is seen all bundled up, complete with farm boots in freezing cold weather, tenderly taking care to be sure that her sheep were watered and fed and protected from the harsh elements or in nicer weather, and not so bundled, helping with the sheering of the sheep. This is all in the course of her day where she still finds time to remodel her farm house, keep her window sills and house warmly decorated with collected bits of artwork, make quilts and tell her country stories all in the free motion quilted pictures she calls "streaming" in her functional potholders, pillows or even in framed art. All her "artwork" exudes her love of this rich rural country life and values. In a world full of superficial and trite, beautiful, but shallow, women, I am delightedly refreshed by Maria, small in stature but strong, practical, and unafraid of rolling up her sleeves and taking on the difficult and hard work of keeping a farm. She is nothing short of being "down to earth" in the literal sense of the word and I admire and love her for it. Make no mistake that behind her quiet and reserved nature is a "strong woman" and tenacious lady! Don't miss getting to know more about Maria through her husband, Jon's blog (www.BedlamFarm.com), as well as her own blog and website,(www.FullmoonFiberArts.com). Visit her and see how she translates her rich and meaningful lifestyle into her unique drawings and fiber art. In order to register for the drawing below, simply go to her website and leave a comment for her anytime between Monday, February 3rd and Wednesday, February 5th. The winner will be randomly drawn from those registered on Thursday, February 8th and the winner will be notified.